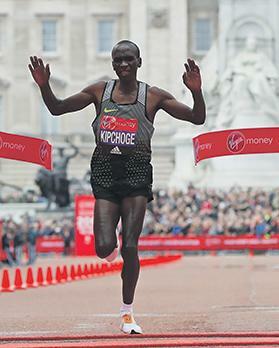 Eliud Kipchoge crosses the finish line at the London Marathon. Eliud Kipchoge produced the second fastest run in marathon history to successfully defend his London Marathon title while his Kenyan compatriot Jemima Sumgong showed remarkable courage after a fall to win the women’s race yesterday. There was sheer brilliance from Kipchoge, who retained his crown in a course record 2 hours 3 minutes 5 seconds and looked faintly disappointed to finish an agonising eight seconds outside Dennis Kimetto’s landmark of 2:02:57. From Sumgong, though, there was nothing but bravery as the 31-year-old picked herself up after banging her head on the ground when she was tripped at a water station eight kilometres from the finish. Astonishingly, the experienced Kenyan battled back into contention and prevailed in a duel with last year’s winner, Ethiopia’s Tigist Tufa, for her first major marathon title since Rotterdam three years ago. Kipchoge, the former teenage track phenomenon whose performance confirmed him as one of the greatest all-round talents seen in endurance running, won his sixth of seven marathons with a fine display. Usually, any revision to the world marathon marks are expected to happen on the record-friendly Berlin course, so there is an argument that Kipchoge’s was the best marathon performance ever on the more challenging London circuit. Kipchoge was even more delighted that, in a race which was effectively doubling as an Olympic trial for a stellar field of Kenyan athletes, he must have confirmed his place for Rio.